Although James Buchanan is our only president to have never married, he did have a faithful — if rather large — companion in Lara, his Newfoundland dog. The president brought Lara, all 170 pounds of her, to the White House with him from his Wheatland estate near Lancaster, Pennsylvania. 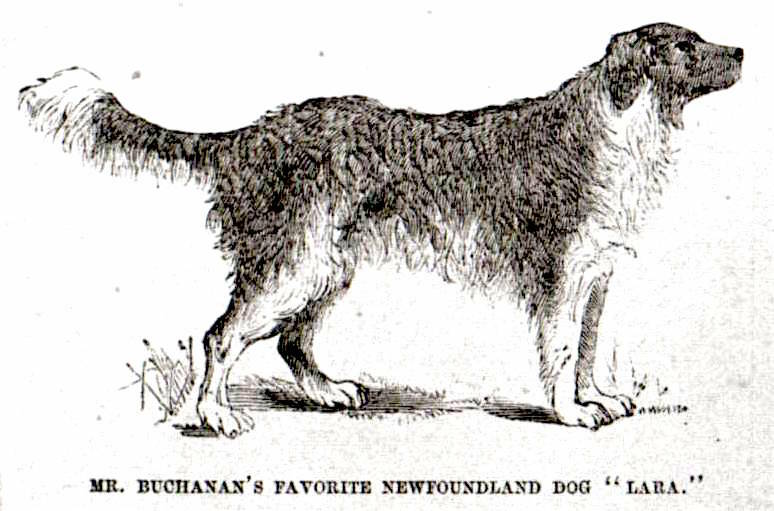 In 1857, it was rare to spot a Newfoundland in the United States. In fact, the breed, which traces back to 1779, was almost decimated when the governor of Newfoundland decreed a law forbidding the ownership of more than one dog. Several sources from the time report that Lara looked like a bear, and she seems to have caused quite a stir in our nation’s capital. In addition to their close friendship, the president and Lara also shared unusual eye habits. Lara had the somewhat unnerving practice of sleeping motionless for hours with one eye open and the other eye closed. Interestingly, Buchanan was near-sighted in one eye and far-sighted in the other. This condition caused him to frequently tilt his head to the left both in conversations and when he was reading. Before Buchanan became president, he served as ambassador to Great Britain. While there, he exchanged frequent letters with his niece, Harriet Lane, who later took on the ceremonial role of First Lady at White House functions. Lane reported that Buchanan often asked about Lara in his letters from England. “He sounded homesick,” recalled Lane. Today, the Newfie is one of the more popular breeds of giant dogs, with Lara’s size and solid black coloring as the most recognizable traits. Lara probably made herself quite at home at the White House — the breed is known for its calm nature, patience, and general easygoing temperament. President Buchanan started off the trend with his Newfie, Lara. Then, three presidents later came President Grant and Faithful. After Grant’s term ended, the next president, Rutherford B. Hayes, also had a Newfoundland; he was named Hector. Finally, the next president after that, James Garfield, also had a Newfoundland. President Garfield’s Newfoundland was named Veto, and you can read about Veto here — it turns out Veto was a true hero dog.